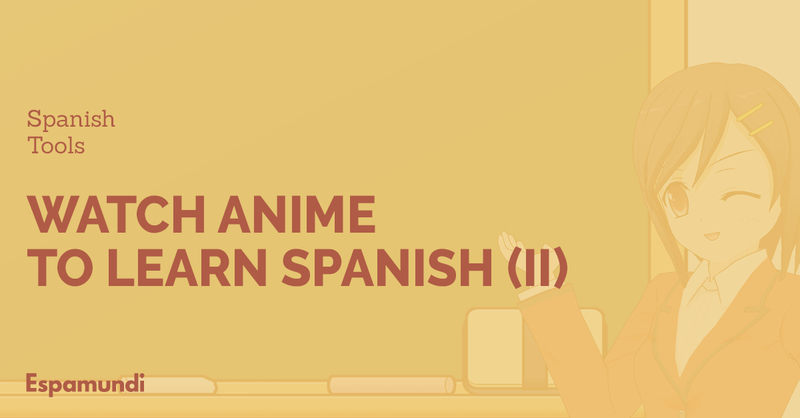 A few months ago, I shared a post with a selection of anime series which are very famous as many Spanish people grew up watching Heidi, Marco or Oliver and Benji. Today, I will share another selection of anime series to improve your listening skills but these animes are not for children. You can find these animes on youtube – links will take you there -. Some of them are dubbed in European Spanish and others are dubbed in Spanish from Latin-America. They don’t have subtitles, but my students with an intermediate level can follow the episodes without struggling much. Don’t panic and take it easy if you don’t understand absolutely everything. The purpose of doing this is to familiarise yourself with the language. Everyone studying a language should find their own way to learn. If you think anime series can be a good option for you, take a look at the following list and click on the title to go to the playlist. In other posts, I’ve talked about alternative resources to learn Spanish, such as podcasts, series on Netflix, if you prefer another way to learn Spanish. Duration: Around 20-25 minutes each episode. Synopsis: Light Turner, a bright student, stumbles across a mystical notebook that has the power to kill any person whose name he writes in it. Light decides to launch a secret crusade to rid the streets of criminals. Soon, the student-turned-vigilante finds himself pursued by a famous detective known only by the alias L.
Duration: Around 20 minutes each episode. Synopsis: Yuuta Takemoto is a college student who lives in an apartment building with his two friends, Shinobu Morita and Takumi Mayama. The series chronicles the students’ story as they struggle through life and love. Duration: Around 20-23 minutes each episode. Language: European Spanish and Spanish from Latin- America. Synopsis: Hellsing, an organization specializing in dealing with supernatural threats, is called in to eliminate a vampire that is turning the villagers of Cheddar into ghouls. To put an end to this, the leader of the organization, Sir Integra Fairbrook Wingates Hellsing, dispatches her most formidable asset: a powerful vampire known as Alucard. Duration: Around 24-25 minutes each episode. Synopsis: Trigun revolves around a man known as “Vash the Stampede” and two Bernardelli Insurance Society employees, Meryl Stryfe and Milly Thompson, who follow him around in order to minimize the damages inevitably caused by his appearance. Most of the damage attributed to Vash is actually caused by bounty hunters in pursuit of the sixty billion double dollar bounty on Vash’s head for the destruction of the city of July. However, he cannot remember the incident due to retrograde amnesia, being able to recall only fragments of the destroyed city and memories of his childhood. Throughout his travels, Vash tries to save lives using non-lethal force. He is occasionally joined by a priest, Nicholas D. Wolfwood, who, like Vash, is a superb gunfighter with a mysterious past. As the series progresses, more about Vash’s past and the history of human civilization on the planet Gunsmoke is revealed. Duration: Around 24 minutes each episode. Synopsis: The series is about a young mermaid princess named Luchia Nanami who comes to land to search for a boy she had saved seven years ago and he retrieved a pearl from her. She ends up finding him, a surfer named Kaito Dōmoto, however, Kaito doesn’t recognize her in human form, and Luchia cannot tell him as she will turn into sea foam if she does, instead, she tries to have him figure out who she really is. At the same time, the mermaid kingdoms are in peril due to invasion from a group of water demons and Luchia must use the power of her pearl to find the seven mermaid princesses and bring back the sea goddess Aqua Regina. With her friends Hanon and Rina, they will use their Pichi Pichi voices to defeat the water demons and find the princesses to restore peace to the ocean! Synopsis: Narue, an adorable schoolgirl with a secret. She’s really an alien with powers right out of a sci-fi comic! But growing up is never easy, and sometimes it doesn’t help when you’re from outer space. Join our spunky heroine as she faces androids, alien invaders, and her first date with the boy next door.